Size: Largest - 30 feet wing span, average 20 feet wing span. Weight: Largest - about 3000 pounds. Food: Plankton, small fish and crustaceans.Ê They have no teeth. 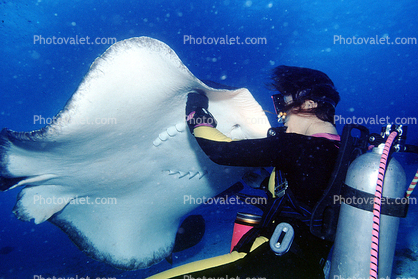 Stinger: Mantas do not have a stinging spine. Babies: Born via aplacental viviparity.Ê This means eggs form and develop inside the mother. The babies are born live and weigh about 20 pounds.